Australian Sled Dog Tours have operated tours on Mt Buller since 2014. Join the friendly team of Siberian Huskies and their dedicated owners for a once in a lifetime adventure you’ll never forget. Tours will be operating throughout the whole season, subject to snow and weather conditions. 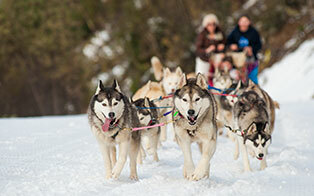 Tours include a meet and greet with the Huskies, a photo session and sled dog tour. Sledding is a "sport" and requires some physical activity during a tour. If you are hesitant about your physical ability please ask one of our representatives when making your reservation. These tours are very popular and will sell out quickly. Bookings are essential so please book early to avoid disappointment. Tours depart from Corn Hill Road which is approximately 1.5km below the Mt Buller Village. A short 10 minute tour, designed for groups of 6 people. Meet and greet the Huskies and take photos. *please note you must be fit and in good health to participate in this tour as you have to run with the team and at times run up steep mountain terrain.